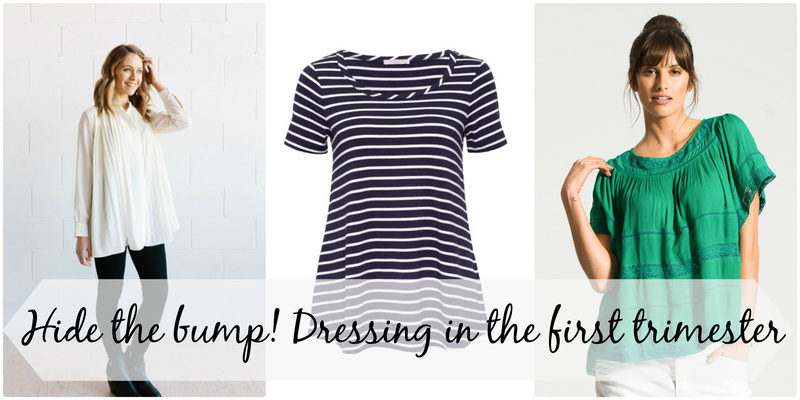 Getting dressed during the first trimester of pregnancy is tricky. If it’s your first pregnancy, it’ll probably be easy to hide the bump. It gets tougher with each pregnancy! Somehow, with second and subsequent pregnancies, those tummy muscles just aren’t as tight and so the belly pops much sooner. If you’ve decided not to share the news of your pregnancy until the magical 12 week milestone, you’ll probably want to conceal the belly until then. Hiding my growing (twin) preggo belly in my fourth pregnancy was a mission. I think I pulled it off! Thankfully I manage to wear my normal pants for the first trimester. While it’s tempting to invest in a bunch of new clothes, shop your wardrobe first. You’ll be surprised to find you probably have lots of clothes that will be perfect for hiding the bump in the first trimester! Soft, floaty blouses are absolutely having a moment. They are perfect for skimming over that belly, or what might just look like you’ve had a big lunch. While you might not wear them for the entirety of your pregnancy, they are great for the post-baby body and often breastfeeding too! Blossom and Glow Josie Pleated Blouse. Bohemian Traders Lace Trim Blouse. Dotti Peaceful Lace Trim Blouse. You can see me wearing this blouse here. 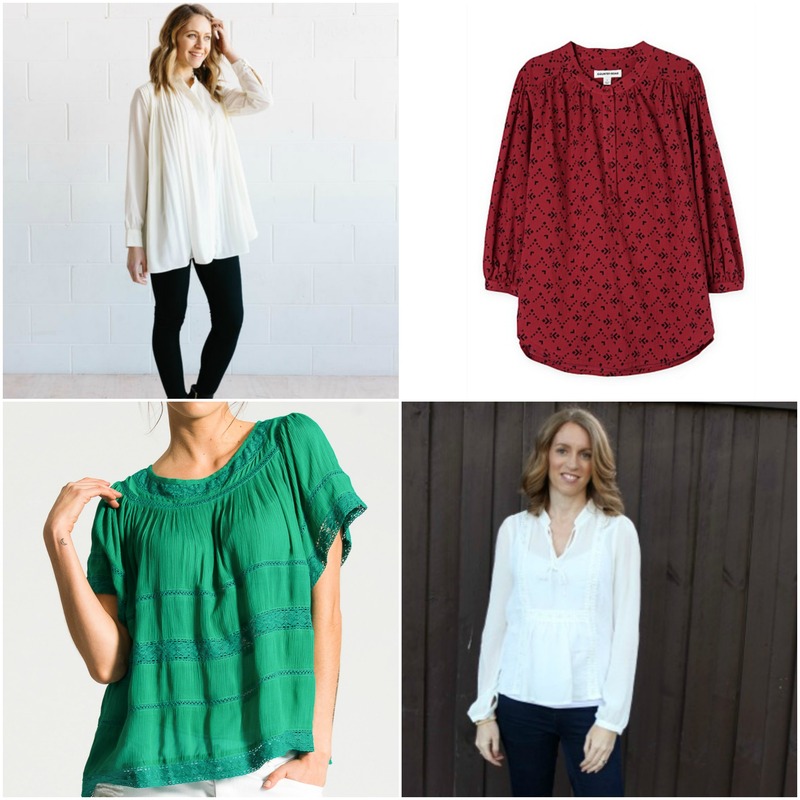 All the folds or ruffles at the front of these tops help to disguise a little bump. A huge bonus is these will be ideal for breastfeeding down the track. 1. Blossom and Glow Maryanne top. 2. Seed Spot Print Shirt. 3. St Frock has lots of drape front blouses in various prints. 4. 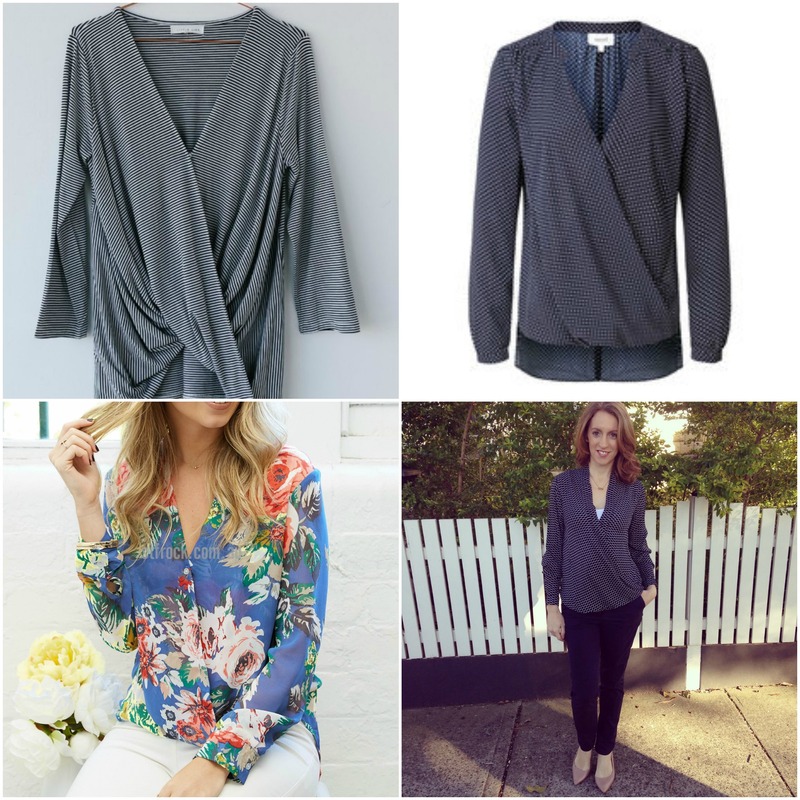 Dotti crossover blouse. The one I’m wearing is very similar. The great thing about swing tops is that they are fitted through the bust and then swing away from the belly. Perfect for drawing attention away from your belly! 1. Bohemian Traders classic swing tee. 2. A stripey version from Metalicus. 3. A Metalicus sleeveless top. 4. Ruby and Lilli in the navy. Most dresses, especially if they aren’t fitted, are ideal for hiding the bump. They don’t grab or cling around the waist. These general styles are great options. 1. A slouchy, tee-shirt dress like this one from Blossom and Glow. 2. Swing style, loose fitting dress, Bohemian Traders have many options! 3. A shirt dress, which will also provide excellent breastfeeding access. This one is from Target, but really, they are everywhere! 4. A shift dress, with room to grow. I’m wearing a dress from Expect in Style that I’ll be able to wear throughout my pregnancy. If your first trimester is in the cooler months, a scarf will go a long way to distracting the eye up away from the baby bump. If you follow Life on Wallace on Instagram you’ll know I am a huge fan of scarves. Another staple of my first trimester wardrobe was waterfall, or drapey, cardigans. They help to camouflage a little belly, especially from side on. I have to say, I’m relieved the first trimester of this pregnancy is over! I’m starting to feel brighter and I’m not paranoid about people noticing I’m pregnant. 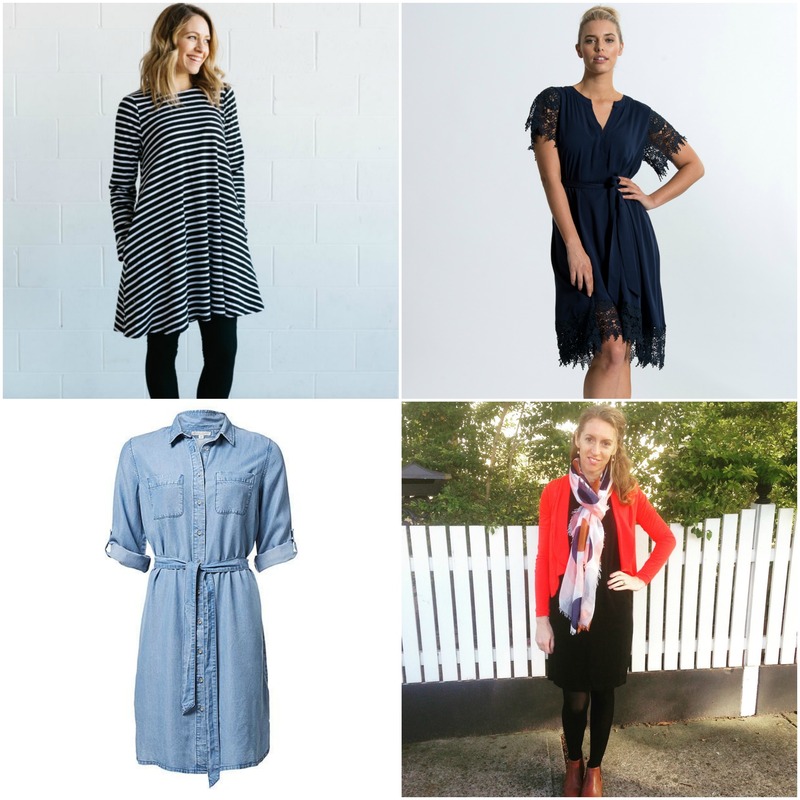 What are your tips for dressing in the first trimester? I’d love to hear your tips and tricks! The belly really does pop faster! Big babies Bec. My second two were 4.1 and 4kg, who knows how big these twins will grow. 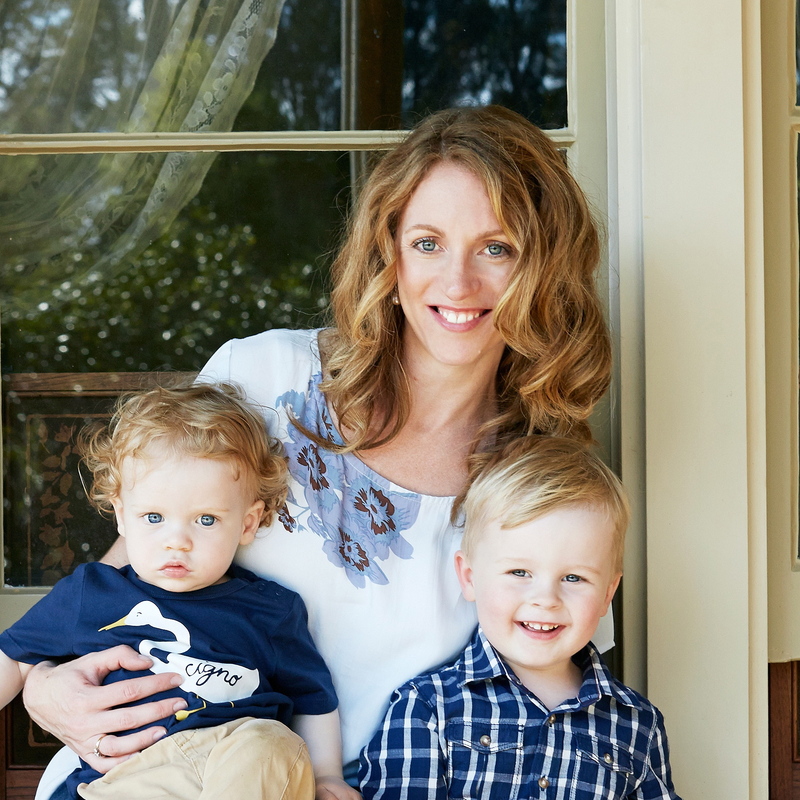 I had twins for my first pregnancy and had to confess early on in the piece! But with my third baby I got away with loose dresses for most of my pregnancy before one of my male colleagues recognised a dress I wore as a maternity one his wife also had and asked if I were pregnant. Brave man! Lucky I was pregnant! That is a brave man! I’m glad you say you had a bigger bump, earlier with twins. I feel huge at 15 weeks with twins, so it’s a relief to hear that’s normal! Thanks Emily. I remember wearing my regular clothes to my 20 week scan with my first baby. No way that was happening second time around! I was more of a “wear your hubby’s oversized t-shirt” kind of girl but was at home for my second pregnancy so I could get away with it! Look, if you can get away with that, then why not! The more babies the quicker my belly popped – not to mention the fact at 4kg babies first and second time around destroyed said ‘abs’. With baby number one I had a 4cm ab separation and with baby number two a 5.5cm ab separation … so I couldn’t hide baby bump number three very well. I can’t imagine how hard it would be with number four being twins! Oh I hear you on big babies and nasty abdominal separation, I have been there! This time I’ve been grateful for colleagues who are either very polite or not very observant! Maternity fashion is so much more stylish than it was 20 years ago when I was wearing it! I’ve no doubt about that Janet! These are such pretty options – bump or no bump. I got asked if i was pregnant far more before I was. I think it was because I lost my beer belly in the first trimester. Losing the beer belly has got to be one of the rare perks of the first trimester! Oh I’m a fan of scarves baby bump or not, haha! 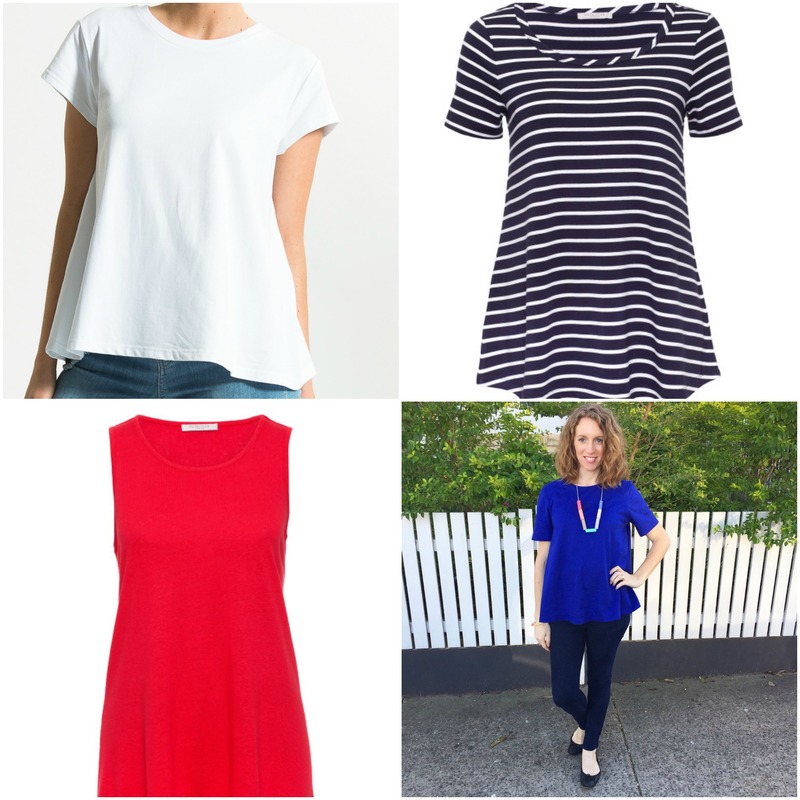 🙂 I had a lot of fun hiding my baby bumps – although I did end up “revealing” it earlier than I’d liked to with my second son – I started the frocktober challenge and only had a few bump-disguising dresses I could wear! I’m with you on that one Mica, I love a scarf! I moved interstate in between pregnancies and my colleagues didn’t recognise any of my maternity wear which was lucky as I was in them from about 8 weeks! That’s a drastic, yet effective manevour Lise!